Did things get a little crazy last month and perhaps a few budget items jump the rails? No problem! You can recoup some of those funds with a Pantry Challenge. Hey you guys! I’ve heard your whispers and wonderings, and yes, we are doing a Pantry Challenge again this year! Oh yes, friend. I’m in! Are you? This will be my TENTH January Pantry Challenge, where I focus on using up what we already have, cleaning out cupboards, fridge, and freezer. I reorganize and reset our grocery budget after the crazily indulgent holiday season. More importantly, my meal-planning, leftover-using, savvy-grocery-shopping habits get a major boost of adrenaline, giving us a great start on the new year. I’ll admit, I was a little embarrassed to post our grocery spending for last month. We had a fair amount of company, an unplanned wildfire to be ready to evacuate for, and, of course, Christmas. Plus, I found boneless chicken and pork loins for 99 cents a pound, so I just really couldn’t pass up those deals. I mean, I would have and could have if we didn’t have the money for it, but since we did have extra room in our virtual grocery envelope, I did. I don’t think I will regret it, but December’s total did look crazy. Always read the fine print on a sale. I got hosed at Ralphs on a roast sale because I didn’t read the receipt carefully. The sale price applied to only one roast, not two, and in the holiday scramble to get out the door, I didn’t notice. That won’t be happening. Ever. Again. ALDI rocks great prices on so many items that we regularly buy that I really need to get more methodical about making sure we don’t run out, leaving me to resort to closer stores because I don’t want to drive so far. While there are some items that we don’t like and some that my daughter can’t have because of nut allergy cross contamination issues, their prices regularly beat my other shopping options. Going into the new month, we’re filled to the brim. I am playing a game of Jenga each time I open a cupboard or fridge door, so I’m really looking forward to seeing some whitespace. Who knew things could get so deep about an eat-from-the-pantry challenge? But really, I think we can learn a lot when we let our pantry supplies dwindle. Fears and insecurities can crop up, yet creativity can flourish. We take away the crutch of convenience and realize we really can live with a lot less. I’m looking forward to this month. As always, you get to make your own rules for the Pantry Challenge. There are no hard and fast rules, except to be honest with yourself. Make some goals, articulate them to us or someone who will keep you accountable, and then try not to break your own rules. 1. To make most meals at home, based on what we have. Some of us eat a meal out each week. My husband takes one child out to dinner each week for dinner with dad. He and I have a weekly date night. I usually permit myself one meal off from cooking so I get take-out for the family at least once a week. I plan to keep to this during the challenge, but to make most meals at home as well as send lunches and snacks to work with my husband. Our college son usually packs his lunch as well. This system works well for us, helps us avoid crap food, and makes it easier to compare my spending and budgeting with the USDA food cost reports. 2. Get the fridge, pantry, and freezer down to the bottom. Yes, I want to get to the dregs. Some years we do this, some years I don’t worry about it. However, this year, I want to go deep. Every storage space I have is full, and I want to do a big clean out. I will still buy fresh produce and dairy. I’m still contemplating about sale shopping. I think if it’s a protein or a whole food that’s on a killer sale, I’ll consider stocking up, but not convenience items. We need to get back to basics. 3. Spend less than half our monthly budget. Last year I set our monthly grocery budget at $1200/month, well below the $1334 that the USDA says it should cost our family to eat each month. I’m contemplating going lower this year, possibly to $1000. I’m not sure if I can pull that off consistently, so for now, I’m going to shoot for $1100. That means I hope to spend less than $550 this month on groceries. 4. Hone my systems for more homemade. Due to busyness and overwhelm, I’ve gotten into some bad habits. I buy more commercial baked goods and canned beans than I used to, things that I know I can make more cheaply and better tasting myself. Since I’ve got more cooks to help out, I want to hone our systems to keep homemade a more regular thing at our house. Perfecting beans in the instant pot. I did it once perfectly and haven’t ever gotten back to that place. My friend Michele is helping me get there. Clearing enough space in the fridge so we can have 5-Minute Bread Dough going all the time. My bread machine died long ago, so I need another hands-free option. Trying my hand at some new things, like crumpets, puff pastry, crackers, and bagels. Getting back to making jam and pickles and applesauce, provided I can find good prices on produce, the thing that has impeded me lately. We won’t need jam anytime soon, but the pickles and applesauce are things we enjoy. We’ll see. 5. Streamline my cold storage. I love my Samsung 4-door refrigerator. One of the great things about this fridge is that you can change the settings so that 3/4 of the appliance is fridge with just 1/4 as freezer. Since I already have a deep-freeze, this is perfect for the family that needs a bigger fridge. Us. But, it still feels cramped. And I haven’t utilized the freezer as a staging area for the week’s meals as I had originally planned. I’d like to get to ground zero and rebuild. My fridge feels too small, but I’m not sure that’s true. 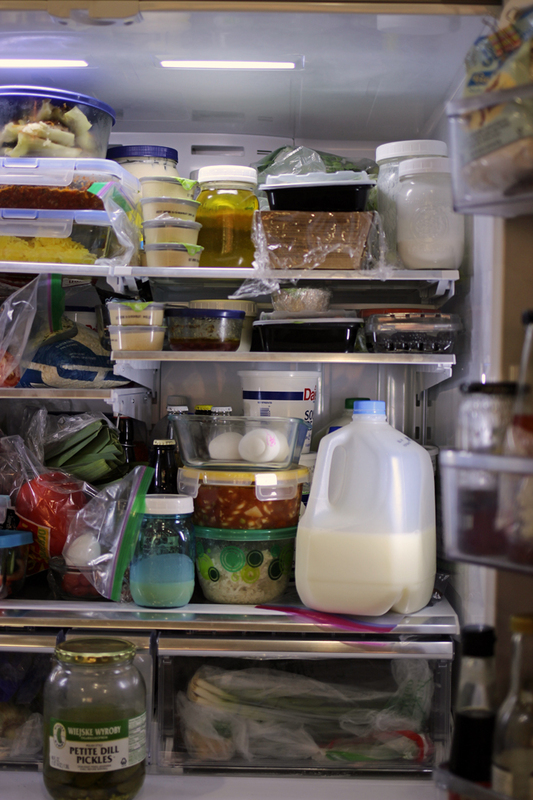 I think stress and busyness lead to clutter in my home and my fridge, so I’m hoping to make sense of ALL THE CONDIMENTS and reform our cold storage habits. 6. Refine how I delegate cooking tasks to my family. For the most part, I’ve been the chief cook and bottle washer these last 24 years, mainly because I like to do it and I get paid to do the cooking part in terms of recipe development, etc. However, no mom is an island. I need help, just like anyone else. My husband is a great cook, so no worries there. My eldest two children (20- and 17-year old men/boys) have pretty much taught themselves whatever I didn’t already show them when they were younger. My youngest two children (9- and 11-year old girls) are addicted to cooking shows, so they are more than ready to experiment with all kinds of crazy things. The middle two children (boys) are coming into their own this year, as I’ve been doing a Food Science class with them. It’s been wonderful to delegate to 13- and 15-year olds the prepping of chicken breast, burgers, taco meat, etc. We are picking up our study again in a few weeks, so they will learn a few more tricks. Overall, I need to have my plans more solidified so I can delegate more. There’s no reason that they can’t do the cooking. The Pantry Challenge may or may not be a good time for this transition. Time will tell. So, there are my goals for this month’s challenge.Last year I was really sick during the month of January; I’m hoping I can also keep illness at bay, because I got work to do! I’d love to have you join me! Do as many of these as you can. Leave a comment telling us your goals. Use the button at the top of this post as well as the hashtag #pantrychallenge on social media to share the fun. Check in each day here. I’ll be posting every day or every other day. I likely will not be able to respond to every comment. My apologies in advance! Check in on Facebook or Instagram. I will try to pop in there each day to share our progress in live time. Enjoy the GCE Community. I’ve been doing this for a long time, but so have Good Cheap Eats readers! 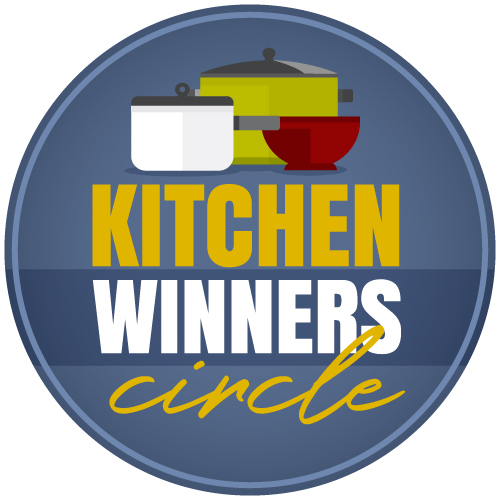 There’s a lively community of Pantry Challengers here and it’s so much fun as the comments get really chatty and we connect in some great ways. Most importantly: use what you have! I am ready Jessica!! Very pumped. My freezer and pantry are not completely out of control but both contain more than what I’m comfortable with. I’m stocked up and the only reason I would need to go to the store during this month is to buy staples and anything I feel I need to go with the meat/fish I take from my freezer that I don’t have. Eating healthy is a must for us so I will use what I have and buy only what I need. Hi Heather: So nice to hear from you. I’m looking forward to talking with you over the next month. Yucky weather we’re having here right? But it’s no different where you live either. Horribly cold. Hi Stephanie and Heather. Happy New year! I’m ready. I am buying produce at Aldi on the 13th and 27th , eggs, 2 lbs cheese, 32 Oz yogurt, and 5 gallons of milk. That’s it. I don’t have too many random things to use up, but still have a big stockpile and it will be good to rotate and free up some food cash for later months. We buy from zaycon and have 30 lbs of chicken thighs I’ve paid for coming Feb 2nd. I”m in! I’ve been looking forward to January to clean out, clean up, and save some $$. This summer, Kid 1 (age 11) was responsible for 1 dinner per week but that fell by the wayside with school commitments. We’re going to restart that ASAP. I’m in! I like your goal of spending less than half of your typical monthly budget. I think I’ll copy that! I also may purchase a too-good-to-miss protein sale if one presents itself but try not to go overboard. I’m very interested in your efforts to make crackers, puff pastry, etc. I don’t buy many convenience foods so would love to have recipes for these items. Looking forward to this. Happy 2018! Hi Lynn. Happy New Year! Happy New Year, Danielle! Good to “see” you again! Wasn’t it you that was giving the NC themed gifts at Christmas? If I’ve remembered correctly, how were they received? It’s good to see you again, too. I hope you’re staying warm in this crazy cold. They all sounded so pretty and useful when you posted about them. I think that’s a definite win! And yes, I”m trying to stay warm in this frigid weather -though we are much warmer than others! Thanks for including the USDA food cost table. The thrifty plan for my family $382 a month. It gives me an idea of what I should be spending which actually is more than I typically budget. I still want to stay at the $150 mark. I love, love, love doing January pantry challenge with you and the group again. As always, I’m overstocked with buying too many “good deals” throughout the year. I am newly retired (after teaching school for 38 years) so will have more time available this year. By the way, I recommend retirement, it’s awesome! My goals for this year…. My husband isn’t always 100% on board. I think it was that late January quiche made with chopped mozzerella sticks and subbing mayo for eggs from a few pantry challenges ago. Won’t try that again. Oh, yes, count me in again this year. Not sure how many years I have done this now but always look forward to starting over again after the holidays. The pantry is in pretty good shape, the fridge is great (went thru it yesterday, chucked anything that I knew we honestly wouldn’t eat before it spoiled, and washed the fridge, inside and out). I know what’s in my freezers, one 8 c ft and the other 10 c ft + the little one over the fridge ( I did an inventory before Christmas). If I was to use some protein from the freezer every day, there is more than enough for at least 5 months!! So, my aim is to use what I have, keep making 95%+ of our breads and use as little as possible in the way of bought processed food. Last year I even made our own ketchup. My budget is not low because we do eat a lot of fruit and fresh vegetables and salads. I love the challenge of doing the best I can with what I have ( or the bargains we find)! Thanks for doing this again Jessica! Hi Tasty. Happy New Year! Good to see you back Daniellle..
How did you guys do cutting portion sizes and losing weight? Tasty, we took a break from trying to lose weight during the holidays. Our goal was just to maintain what we had lost so far, which we succeeded in doing. Now we’re working on getting back on track to continue losing. I’m in! My goals are to reorganize my food storage so that it makes sense for our family, get back to a better lunch habit— instead of driving through some place while we’re out and about, which sort of leads directly to being better at planning and organizing. My bigger kids are getting more independent in the kitchen, but my 11 year old marveled at my ability to sauté broccoli yesterday so maybe they’re not as independent as I think they are lol! Thanks for doing this again! Last year i had a 2 month old and just couldn’t add another thing to my plate; this year it feels like a necessity! This will be my second year to accept the challenge. I’m not as overloaded this year as I was last, but I want to be mindful of using what I have as well as using self control when shopping, especially at Costco! I’m in! Technically I started last week, I took inventory, figured out several meals, some that need no additional items and some that need 1 or 2 items purchased to make and I spent $28 on groceries. I’m contemplating goals, we have lots that need to be used up but I also signed up to participate in a weight loss challenge/ support group, which suggests we eat salads once daily. Pantry challenges have proven to be carb heavy in past years so balancing the 2 will be interesting. We’re fairly low on lean proteins and fresh vegetables. As if this isn’t challenging enough, my husband hasn’t worked much in the last 10 days due to subzero temperatures here in the Kansas City area, this may dictate my budget and goals more than the other factors as the month progresses. We have 4 people in our family and the 2 children have become bigger eaters recently so our $100/week budget has been blown most weeks this year. I think $30/week sounds like a good and fair number to keep all factors in balance. I received an Instant Pot for Christmas so another goal of mine is to learn to use it and perfect beans, soups and stews with this new kitchen gadget. Looking forward to the challenge! 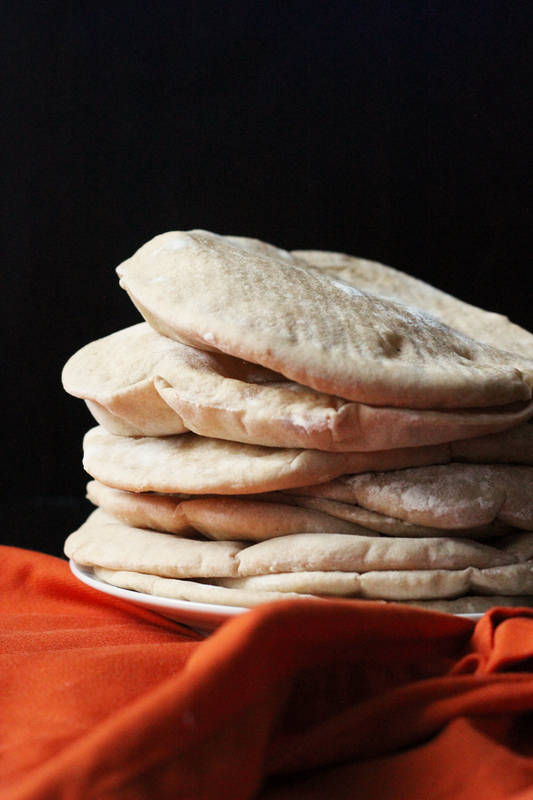 The PC can be carb heavy, depending on how you stock your pantry regularly. I’m learning that I need to do more frozen vegetable stocking. Salads in winter KC could be expensive. #beenthere I might suggest looking into more cabbage/winter greens for your salads. Might be more affordable and probably tastier, too. However, for many reasons am so ready for this. 2017 was a disaster in some ways and I didn’t get to cook from scratch as much as I wanted to- mainly because of pain, then surgery in June, and the long recovery to being able to be on my feet for any extended period of time. I CAN now and of course it’s only been the past few months and somehow it was just extremely busy and my habits deteriorated due to all that. Anyhow, we really really need to reign in spending. University costs are high and the less we need to take out of savings for that the better. We likely need a new car (or 2!) this year too. So. I know we will have to spend some $$ on proteins(our freezer isn’t quite as stocked as usual, probably due to my bad habits and how busy we ended up the past 6 weeks so no last costco protein stock-up I’d planned to do in December). And we always continue to buy fresh produce/dairy, etc. My goal is that no one knows we are Challenging, but we just aren’t spending as much. So that also means what son takes to school for lunch (and eats for breakfast) won’t change and will likely need replenishing. Actually goals include: spending way less on food, using up lots of what we have so no waste, cooking from scratch as much as possIble, trying new things(like Jessica), and using new tools I got for Christmas and hope to get for my birthday. I need to clean out the fridge and inventory (post holiday/vacation necessities! ), but the latter won’t happen until next week. Too busy this week. I’ll wing it for now. I’ve been really lax about picking up random things that were a good buy but I didn’t actually need, so these freezers are totally stuffed again. I haven’t been online all week, so didn’t even know if you were going to do one again this year. I cleaned out the fridge today, with the idea of using up some leftovers and then getting serious about getting the freezers worked on. My plan is to re-org the outside freezer again tomorrow or Wed so I have a good idea of what is actually stuffed into it. If it isn’t fresh produce or perhaps some dairy, I do not intend to buy it this month. What I enjoy most about the challenges is that I usually end up finding and trying different recipes so it helps break ruts. That is so me! I am totally addicted to finding that “good buy”. Sometimes it works. Other times, as I count the fifteen boxes of pasta that I’ve bought for well under a dollar each (for the two of us) I just groan. On the other hand, in December I bought a box of Quaker Oats apple cheddar rosemary flavor in those little packets for $0.37 at Grocery Outlet-not even past pull date. I’m thinking muffins?? I need help. I’m thinking that would be really good in scones or biscuits! Uh me too! My husband was hinting that we are getting a whole pig in September and do I think they’ll be room? I’m like of course dear. As I look at my jam packed freezers I’m hoping. Lol. No, I know there will be room because I am refusing to buy ANYTHiNG but fresh produce and dairy until I see some white space in my (3!) freezers. I am excited to do the pantry challenge for the first time. I always read everyone’s posts from years previous challenges. This is a good time for us because my husband is a part time college professor so he won’t get paid until February 1 last year it was the 15th. I stock my freezer and pantry pretty heavy leading into Christmas time and the summer because our income goes way down ( my husband does get a retirement from the military and he also gets disability this covers all bills except food). I hope to use what I have and save some $$ last month we had a $1000 car repair I would like to put that back in emergency fund. We are a family of 3 ( husband 59, me 44, dd 16) and 2 miniature Daschunds. I will have to purchase dog food for my girls other than that fruit, veg and dairy I hope. Welcome to the PC party! You’ll find lots of encouragement here. You can do this! Melissa, and anyone else who is new to the PC – the support and advice here is amazing. So, welcome and come each day and share what you’re eating, celebrate when you have some space in the freezer and commiserate with the rest of us when tbe freezer doesn’t empty as quickly as maybe we want it to!! I’m in! Our grocery budget needed to be halved during the last two months of 2017 due to some challenging financial needs so this is really month three of my efforts to use what I have and be aware of my spending. We enjoyed a few splurges over the holidays but I was able to keep our food purchases to a reasonable amount. We are low on proteins with the exception of roasting chickens which I bought in bulk last October. Fresh veggies and dairy along with proteins are our big expenses. I do have quite a bit of produce in the freezer or canned up from our garden last year which will help! My goals are to spend no more than $400, ideally $300; use up the items in the pantry (crackers, seeds, nuts and dried fruit) that are not everyone’s first choice, and therefore will not be purchased again; to limit processed foods and sugar. I am also trying to extend this mindset to toiletries/cleaning supplies. Hi Laura! My husband teased that we were better stocked than CVS with toiletries, so I made a special effort to use them up-all those hotel soaps, sample dental supplies, etc. I made a dent in them, but still have many available, so I’ll be working on this too! I am so ready to do this!! My two fridges and pantry are out of control!! I am ready to go. Inherited a lot of food when MIL passed away in addition to what we already had so the freezer is pretty full again. Looking forward to another PC. I’m ready. I’d like to see some white space in my freezer too. You’ll find lots of encouragement here. You can do this! It’s fun! Kind of like a game with lots of supportive friends. Oh this is great– you’ll love it. And, we are all here to support. Welcome! Yesterday was all about using leftovers which went very well. This morning I am making spaghetti sauce in my instapot using up leftover veggies plus homemade tomato sauce from the freezer. Planning to make homemade spaghetti noodles later today and garlic bread from leftover dinner rolls. Split the package of hamburger, leaving out enough for hubby to have a hamburger or Salisbury steak. Count me in. Hopefully I won’t have to buy any groceries. Fingers crossed. We always eat a very different diet in December compared to our normal diet. Since my DH is a vegetarian and traditional Danish Christmas food is very meatbased and quite heavy, we are ready to go back to our normal diet right about now! 1. Streamline my cooking and shopping process. I have been struggling to stay within our budget and have been spending more time in the kitchen than ought to be necessary. I need to find a new routine to free up time to do other things around the house. 2. Make space in the freezer to store more freezer meals. This ties in with my first goal. If I have meals ready to go, I don’t need to think as much and I will have more energy for other things. 3. Use up odds and ends in the pantry and freezer. My pantry is quite organized, but my freezer is crammed full, so I need to focus on using some things up. I do have a fair amount of food in the freezer which I don’t want to use up right away (butter, fruit from our garden, expensive cuts of meat), but I need space and I need to find out exactly what is in there! 4. Free up grocery money for extraordinary sales and mark downs so I can take advantage of them without going over budget. Last January I found some incredible mark downs on things we need and use, and I hope to do the same this year. I have already seen some incredible sales, which I know will only come around once or twice a year, so I am taking advantage of them. I am not buying food for the freezer, but things like olive oil and breadflour, which I know we will use and I don’t want to be without! I don’t expect to save a huge amount of money this month, since we are already spending quite little, especially considering that we buy 80-90% organic. Most people in Denmark spend a lot more than we do, even if they don’t buy organic. Our children are also growing, so they eat more! If we can keep our budget where it’s at for another year, I think we are doing well! Can’t wait to learn more about Denmark from you, Kathy! Glad to see you back Kathy! I’m in. One of my goals for this year is to finally get my grocery spending under control. I enjoy grocery shopping the way most women claim to enjoy shoe shopping (which for me is torture), so I always spend way more than I need to, and use grocery shopping as way too much of a coping mechanism. We have entirely too much of pretty much everything right now, so my main focus this week is using up the perishables before they go bad. Other than that, the fridge is full, the chest freezer is full, and the cabinets are overflowing, so the goal is to make a dent in what we already have, and only buy fresh vegetables, fruits, and dairy this month. We took a break from trying to eat healthy during the holidays, so we need to get back on track with that, which unfortunately doesn’t completely mesh with using up things like the cheese and pasta I bought too much of. I think we’ll be alright if we do some splurge meals, but mostly focus on lower carb meals. We need to find a good balance between eating to lose weight and eating to fatten up the checking account. I think our budget for the month will be $50.00 – $60.00, since we’ll just be buying fresh produce and some dairy. I’m hoping to keep the budget that low. If I have to go a little higher to keep us eating veggies, then I will. I think it’s doable, though, as long as I’m careful, and buy all/most of our veggies from Aldi. And there are only two of us, so that helps. Also, if you saw my cabinets and freezer right now, you’d probably say that I have no business spending any money at the grocery store this month! This is my 10th year doing this (in some form) with you. My goals, #1clear the coffers of my pantry and freezer; #2 Eat Healthier and LESS (I’ve lost almost 100 lbs) and get my family on board by filling the pantry freezer with only healthy foods (AACK); #3 Spend half of what I would (or less) for the month of January (and maybe February, as I really think we have THAT much food here); #4 Embrace a REAL Budget (with the death of my father and three surgeries for me in the last year, everything is topsy-turvy. I’m taking it all back to organized!). I’m in. I want to save money and use what we have on hand. I just made pinto beans last night in my Instant Pot and they were a success. Note, I have a 3 qt IP Mini. I used a pound of beans and 7 cups of water, plus some spices (garlic powder, cumin, and onion powder), plus 1 Tbsp oil (to prevent foaming out the spout) and cooked on the Beans setting for 30 mins. Let release naturally for 15 mins or so, then stirred in some salt. Next time, I might reduce the water a little, and maybe up the spices even more. Good to know. Did you presoak the beans? I just made black beans in my instant pot yesterday. No presoaking & they turned out perfectly! Jessica, do you have many IP recipes posted on the blogs? Not yet. I have a few in the queue, but even though I’ve had an IP for a very long time, I only used it for rice and eggs for the majority. Branching out a little now. I’m in. Husband and I were going to start a Whole30 this month but have decided that eating down the pantry is more of a priority. I’d like to empty out our deep freeze and sell it. It’s not getting the use it used to – I no longer buy a side of beef or cook in bulk as much. Come autumn, we’ll only have one kid at home (and two away in college) so no need for as much of a stock pile. Reducing our grocery bills will be helpful, too. I like that delegating part! Haha. It’s -9° here and the complaining about the weather is just beginning. -9, -9, -9….burrrr. I have to do this! I so wanted and needed to defrost our freezer in the garage this summer but never found any white space. There’s only the two of us now, I know we’re eating and I still have too much food. I won’t even mention the leftovers that never seem to disappear or the deals I don’t seem to be able to ignore. 1. Spend even less than I did last Jan. ($144.69). We have tons of proteins and the pantry is well-stocked, so I should be able to get by with purchasing only dairy, fresh produce, a couple of boxes of cold cereal, and perhaps some frozen OJ and peanut butter. This year I’d like to trim our monthly budget to $250 (from last year’s $300). We’ll see if it’s possible. I’d also like to limit food waste (although we rarely truly waste food–it’s either given to the chickens or composted for the garden–I think I can still improve in this area). 2. Be intentional about planning and shopping. For instance, I know that seafood will go on sale during February and March due to Lent, so I’d like to clean out enough room in the freezers and save enough money in January to take advantage of those sales. Also, in November I started being more careful about comparing per unit (oz., lb. etc.) prices, so I’d like to continue with that. I think I may also track my grocery spending (a la Grocery Geek) to get a better idea of the typical prices of the items we regularly buy. It feels like prices have gone up at some of the stores we used to count on to be inexpensive (I’m looking at you, Sam’s Club), but I’m not a numbers person so I need to track things to confirm or debunk my gut feeling. 3. 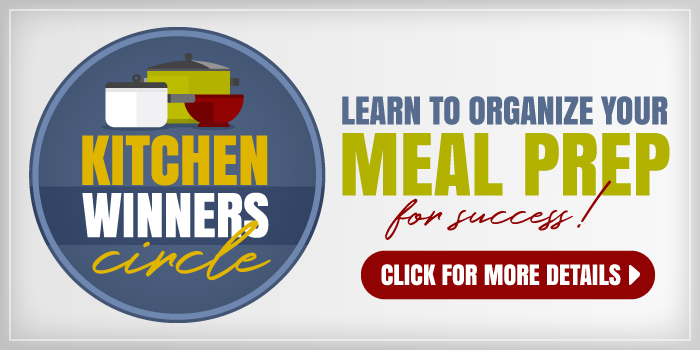 Eat mostly home-prepped meals, and use a cash-only/envelope system for meals out. For some reason, we were pretty bad about this last year, and that’s not good for our budget or my health. As sub-goals for this, I’d like to continue to try new recipes, eat more homemade soups, and get back to being intentional about “eating a rainbow” and avoiding soy and added hormones in dairy and meats. 4. Find more space in the freezers. With only three of us, there is no way I can empty out my freezers in one month (unless I were to just toss everything and start over, but that would go against the goal of minimizing food waste), but I would like to make a dent in them. I’m sure I’ll have to continue the PC into February and beyond. 🙂 Last year we made great progress on the refrigerator and pantry; this year I’ll focus on the freezers. Hubs is on board (and son doesn’t particularly care). I’m blessed to have a family that doesn’t mind leftovers or vegetarian meals–as long as there’s enough food, they’ll eat most anything (Brussels sprouts aren’t a favorite, but I keep trying–ha!). Also, Hubs likes to garden, so we can supplement our groceries with home-grown goodies. I’m looking forward to learning from all of you. Bring on the new year! Breakfast for hubby was eggs sausage and hash browns. For me. Fried rice. The spaghetti sauce has been simmering all day. I’m ready to make pasta to go with it. I’m in for my third January Pantry Challenge! I will buy produce and dairy and limit eating out to social occasions, not convenience. I have learned from previous experience to spend the first few days eating from the fridge. Clearing out the remaining NYE goodies and other odds and ends will make room for defrosting meats later. I’m in again this year. Need to eat down the freezer and pantry some. Also want to do more freezer cooking in the next few months and get the freezers organized. Also need to get started baking again. Instead of keeping the dough in the frig, it worked better for the two of us to just bake up the bread in two bread pans and freeze the loaf we weren’t using until ready to use it. I got in the habit of keeping an extra loaf or two in the freezer and it worked well for us. I need to get back in the habit. Kudos for making sure that all the kids know how to cook. It is an important life skill and I have known grown young women who really struggled to learn. So sad. Count me in for another year of the PC!! I spent on average $15/month more than I wanted to last year. This year, my goal is to incorporate those $15 of bulk nuts, fish and fresh produce items and eliminating something else to erase the $15 over-spending. Pantry and freezers are full and historically the early months of the year are lower in spending, the later months things get pricey because I’m in need of restocking. But that’s perfect b/c I want room in the freezer to take advantage of the lower holiday pricing. And then there are those “too hard to walk away from this low price sale” that I’m famous for stumbling upon in the midst of summer! LOL! Another passion of mine is waste. I can’t throw out the tiniest bit of food…and 2018 will be no different. Today, I defrosted ALL the veggie scraps from the holidays and made 7 Mason jars full of golden veggie broth. That is a peak into what my freezer looks like. Not just meats but random small packages of food waiting to be transformed into a meal. In 2018, I want to stay on top of that better and have fewer of these random packages. – use up those tiny packages of food instead of having a massive collection of them in the freezer! I am officially in this time! In years past I’ve participated in spirit only but now it’s time to step up and officially commit to the challenge. I’m looking to cut my $250 monthly budget down by 50% to $125 for just the two of us; in theory it should be a piece of cake but I SO love to grocery shop and get those deals! We have plenty of garden produce either frozen or canned plus dried herbs from this summer’s crop, in addition to a fair amount of beef but we will need to purchase some seafood/fish and/or pork for variety and fresh fruit and dairy. I’m looking forward to some great ideas and inspiration from all of you! Cindy, my budget is to average $100 month for two adults. I don’t buy DH his junk food, I tell him YOYO for that! LOL! It does not include dining out. We dine out on occasion when traveling to see family and for special occasions. That has a separate budget. In 2017, I went over budget on average $15/month. I think you can do this esp since you have a garden to work with. Thank you for the vote of confidence Felicia! I hope I can do as well as you have done, very impressive! We too have a separate dining out budget which is a blessing since it can take a big hit when our out of town kids are here and are craving some of their hometown favorite restaurant foods. My “hit” comes when I travel to see them….they want us to try their favorite restaurants where they now live or I cook their “home favorites” at their place and of course, we buy the groceries. Since it is just DH and myself, I can get buy with Manager’s Specials meat packages as they are enough for two with the occasional leftovers. Clearance items, mark-downs, BOGO, couponing and sales. I do alot of cooking from scratch too which is a huge savings. Today, I was able to re-use turkey leg bones to make more turkey stock. I steamed my Halloween pumpkin in the microwave and have five 15 oz bags of puree pumpkin now. That alone has saved me about $4.96 [and that’s using the Libby’s clearance price at $1.59/can that I saw this week]. I’ll be making two loaves of pumpkin-banana bread, one for now and one for the freezer. Every little bit saves some money! I’m in! I look forward to this every year. (1) use up freezer stash of soup, sauce/meatballs, and ham. (2) use up all contents in and THOROUGHLY clean large pantry cupboard. (4) expand our repertoire of meals (my 4 kids are picky; I’m grain, gluten, soy, dairy, and FODMAP free; my middle daughter has a severe peanut allergy and is also struggling with poor weight gain). All these variables/needs with regard to meals around here have me intermittently overwhelmed. We need more options! Thank you for doing this again, Jessica! I’m grateful for the support. Long time reader, first time posting. I have been following the pantry challenges for the past 3 years. My family doesn’t know I have been doing it the past 3 years or they would have fits. So I still won’t be able to mention it. As long as I keep their favorite snack foods stocked they haven’t ever noticed. We are a family of 4 (husband 47, me 46, son 18 senior, son junior turning 17 on Jan 5). 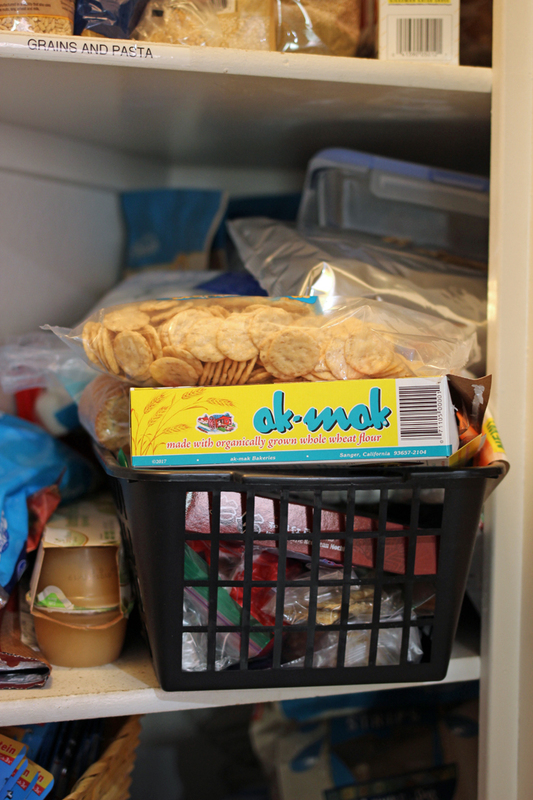 Freezers are full but pantry staples are low on some items. Will be interesting and will have to stock up on some items. Should be fun, looking forward to reading everyone’s posts. I am so ready to restart eating from the freezers and the pantry ! Now that we finally have reliable internet service I will definitely be posting. I am only cooking for my husband and I on a regular basis now. We stopped doing foster care in October and our 18 year old adopted son was placed in Boystown for not complying with a court order. He is thriving there so it’s the best place for him right now. My goals for this challenge are to eat down the proteins and vegetables in my freezers. My husband eats alot of yogurt (cherry is his favorite} and bagels (he likes everything bagels and onion) and I would like to reduce this expense by learning to make both these things. I want to limit my grocery spending to $50 per week and I think I can do it if I plan well. It was wonderful to see so many familiar people in the comments and welcome to all the “newbies”. You will find alot of support and ideas in the comments from all of these wonderful people! Congratulations on your health improvements! Thats amazing! This is my 3rd year doing the challenge. In the past several months I overbought and have tons of food from the holidays. We were so busy the last half of the year, we were barely home in the evenings. So now things are settling in, my goals are (1) bring my spending back under control every month (2) transiton to a better diet for my family by eating the rest of what we have and over the challenge- replace those foods with better options (3) downsizing our pantry from 3 1/2 cabinets to two or less. I did my inventory and cleared out expired/old food. We are a family of 5 45, 42, 16, 13, 10. Our USDA spend should be about $1400 as we live in Hawaii. I’d like to bring that down to $1000 or less as I feel we waste a lot of food. Marci– Those are great goals! I need to reduce my pantry too! If I reduce the pantry I’ll have room for all the appliances that are currently above the cabinets and stuffed in other random places. The cost of living in Hawaii is so high! Hopefully you will be able to reduce your spending over time. We will be cheering you on! thanks Pat you read my mind! thats what Im trying to do- is find room for the appliances that are on the counter. YES- cost of living is high, A gallon of milk is around $5.75 and organic milk is double the price. crossing fingers I can save some $$! Took a few cans of tomatoes out of the pantry to make red sauce for pasta tonight. Took inventory of the kitchen freezer and found a piece of Italian sweet sausage and leftover pork pieces which went into the sauce too. I also found several bags of poultry bones (chicken and turkey) and with some water and other veg scraps, have a crock pot full on my kitchen counter for overnight cooking of stock. Breakfast – oatmeal and hot tea. Dinner – cheese ravioli from the freezer (yay!) with breaded cauliflower (also from the freezer!). I am SO excited to join you! We just moved into a new house, so I don’t have a pantry to purge (hooray for me! ), however I am committing to using up every single thing I buy before going shopping! Blogging throws me for a loop sometimes (all those Valentine’s Day desserts for two don’t bake themselves, you know, LOL), but it’s a separate part of my pantry. Just last night, I roasted sweet potatoes, added bean chili (instant pot! 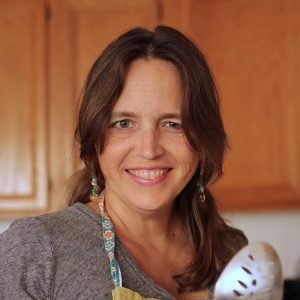 have you seen Heidi from 101cookbooks Instant pot recipes?! ), and a salad. I started my informal challenge at the end of December. I am inspired by everyone’s story here. I am single and my biggest problem is that my eyes are bigger than the amount of people I need to cook for. I have a stuffed deep freeze, a full pantry, and a full fridge, which no single person should have. I did an inventory over the last week and it is 3 pages, 3 columns per page! The other side of my desire to do this is to save money. I love to travel and want to save enough for overseas travel yearly. My goal is to halve my monthly grocery budget of $350. Also lower my restaurant spending, too. Dinner tonight–used up tub of ricotta in Mark Bittman’s Ricotta Gnocchi. Froze uncooked gnocchi for later meals. Going forward–Lots of grain bowls to use up all of the exotic grains and rice I have collected! 2017 was a rough year in my house. We are trying to start 2018 on a good foot. My goal is less than 100 dollars on food this month as we eat out the deep freezer etc. I’m ready! Let’s do this. Baby number 4 is now 8 months and we have been getting into a little more routine since she started sleeping more than 2 hours at a time. After holiday richness and feeling my jeans get tighter I’m def ready to eat lots of produce and use up what we have. I never want to see another cookie for a long time. I started last week by making a huge batch of been stock with a bunch of the bones from our last steer- frozen bags of stock take up much less room than huge beef knuckle bones. Today is Swiss steak with mashed cauliflower and some sort of fresh veggie. Prob some steamed beets with butter and broccoli. The Man Crew House is IN! Between christmas overspending, too many convenience foods, and one too many stops at the drive through in the past 6 weeks, the food money envelope is empty and the fridge/Pantry/freezer are overflowing and yet everyone is complaining that there’s “nothing to eat”. Translation: nothing is ready to fall into their wide open mouths every time they open a cupboard or fridge door. So, this mama is ready to fight back! 1. Get the cold storage to the bare minimum so I can defrost it and clean it well. 4. Eat at home. We’ve developed quite a bad habit of eating out more often than our budget can truly handle and that ends today. I’m aiming for one family meal out this month. Everyone else eats at home or packs a lunch. 5. Remember that I bake fantastic bread and it’s better for us and way cheaper than store bought bread. I think that’s enormous gah goals for one month. ? I downloaded the photo so I can play along. I’ll be using #PantryChallenge and #GoodCheapEats on my FB page and my blog. Can’t wait! Last paragraph should start with I think that’s enough goals for one month. Well, today went kind of off the rails. Ever start a big organizing project and then half way through whilst looking at the giant mess you’re thinking why oh why did I start this today? Dinner was supposed to be Swiss steak. I opted to use my last 2 cups of brown rice and make ham fried rice with steamed broccoli on the side. Quick, easy and there’s just a smidge left for husbands lunch tomorrow. I also cleaned the fridge today so I know what I’m working with! Wowza! Just did my pantry and freezers inventories! ?? SO. MUCH. Stuff! Its definitely time to work down the reserves lol. I want to limit myself to only buying fresh stuff like dairy and produce to complete meals. We have plenty of proteins! Not only sale items like pork and chicken but we got a side of beef in December! And the junk food lol! Halloween candy plus Christmas candy and a few packages of cookies! Dessert for everyone after each meal! ? looking forward to this challenge of creativity and ingenuity! ? Glad you’re joining us, Lauren. I look forward to hearing how it goes!